What a sad time you have had of late . Hope life gets better for you soon. I'm sorry for the loss of your brother-in-law and the kitten. Very sad times! 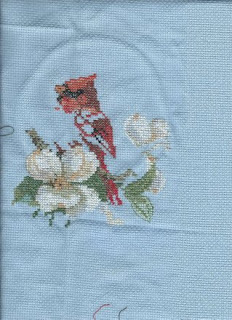 Your cardinal piece is coming along nicely and I hope you're soon feeling well enough to continue the stitching. So sorry to hear your news, I hope your family is managing ok. Treasure your memories. I think once you stitch more of the cardinal, it will look better. Although I don't think it looks bad now!